The Lowland Crop Rotation System Group conducts research aimed at establishing a rational large-scale paddy field crop rotation system in Hokkaido region. So far, we have explored the possibility of direct sowing of dry seeds in well-drained fields in order to promote labor saving of rice cultivation. 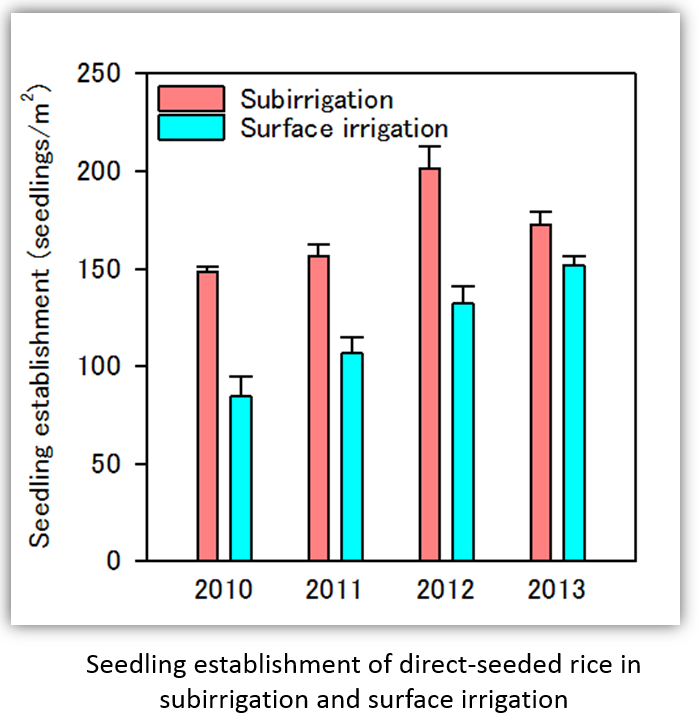 With the use of subirrigation, we were able to stabilize the seedling establishment of direct-seeded rice in well-drained paddy fields. As a result, the technique of direct sowing of dry seeds in well-drained paddy fields has become popular in Hokkaido and will be further expanded. Based on these achievements, we are currently conducting the following research. The rice cultivar "Kirara 397" is widely cultivated as a commercial variety in Hokkaido. However, it is essential to introduce higher yielding rice varieties due to the recent demand of further cost saving. Therefore, we will pursue research towards reducing farm work by introducing labor-saving technologies such as sparse cultivation and no-puddling cultivation with high-yielding rice varieties, and high-yield cultivation technology. We are also preparing cultivation manuals to introduce these technologies. The increase of the yield of soybean in converted upland fields in Hokkaido has remained marginal in recent years. This is considered to be caused by the unbalance of soil nutrients and soil physical conditions etc., therefore, it is necessary to comprehensively diagnose the nutritional status of the plant and the physical properties of the soil for the improvement of production. For this reason, we will promote the development of simple plant / soil diagnostic methods that can provide a stable increase of soybean production. In addition, we will also investigate the effect of non-puddling rice cultivation in the crop rotation system on improving soil quality and rice yield, and that the effect of introducing an intercropping system of wheat with soybeans on wheat yield and fertilizer saving. It would show that these techniques are useful for the productivity of field crops and maintaining soil fertility in the paddy-upland rotation system. Toward the realization of the highly profitable paddy field farming system through the introduction of open-field vegetables, we are pursuing research on adequate soil moisture management using subirrigation fields in onion cultivation and combined with direct sowing and the phosphate fertilization technology to save labor.